SAP BW/4HANA is a new, next-generation data warehouse product from SAP that, like SAP S/4HANA®, is optimized for the SAP HANA® platform, including inheriting the high performance, simplicity, and agility of SAP HANA. BW/4HANA is a new product for the next generation of real-time data warehousing. Similar to SAP S/4HANA, SAP BW/4HANA is natively built on the SAP HANA platform. 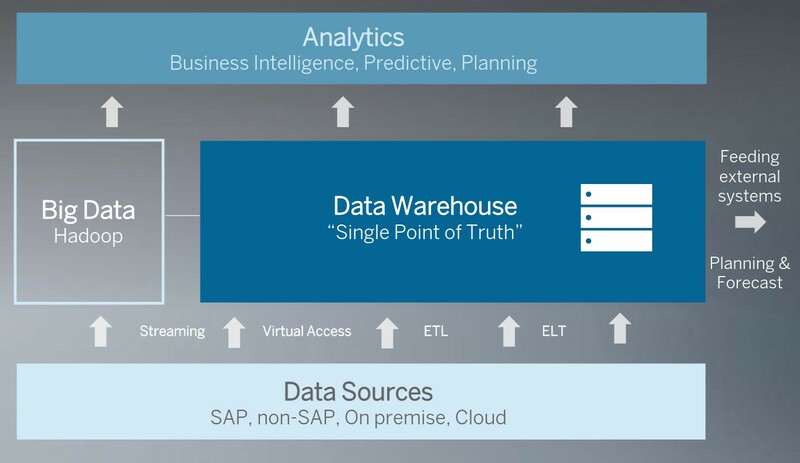 SAP BW/4HANA delivers real-time enterprise wide analytics that minimizes the movement of data, to allow a single, logical view of all data, including new data types and data sources by providing a logical data warehouse. SAP BW/4HANA is a separate product which is not part of and does not depend on a NetWeaver delivery. The underlying platform consists of the ABAP application server and ONLY runs on SAP HANA. So it is independent of Netweaver and any 3rd party DB and hence more innovations will be delivered through the BW/4HANA path. BW4/HANA leverages HANA EIM to provide new data acquisition mechanism such as replicating data in real-time, accessing virtual tables etc. Number of Source System Types reduced from 10 to 3. Only available is SAP HANA, ODP and File system. 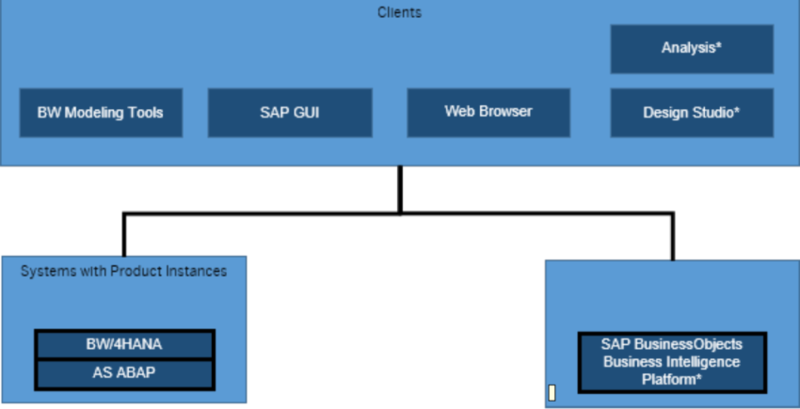 For customers running SAP BW powered by SAP HANA or any DB today, who choose to move to SAP BW/4HANA, we recommend upgrading to SAP BW 7.5 (SP02) on HANA and applying the SAP BW/4HANA Starter add-on as an intermediate step. From the starter add-on, tools are provided to transfer from classic BW objects to BW HANA-optimized objects and data flows. The level of customization done in the customer’s system, will determine the amount of automation achieved by the tools provided. Upon transferring all objects and data flows, as well as successful system preparation checks, the system can be converted to SAP BW/4HANA. Currently we are not supporting the conversion to SAP BW/4HANA, if you are already using SAP BPC 10.1 (standard and/or embedded model) the conversion will be supported with the availability of the new SAP BPC add-on for SAP BW/4HANA when it becomes available. 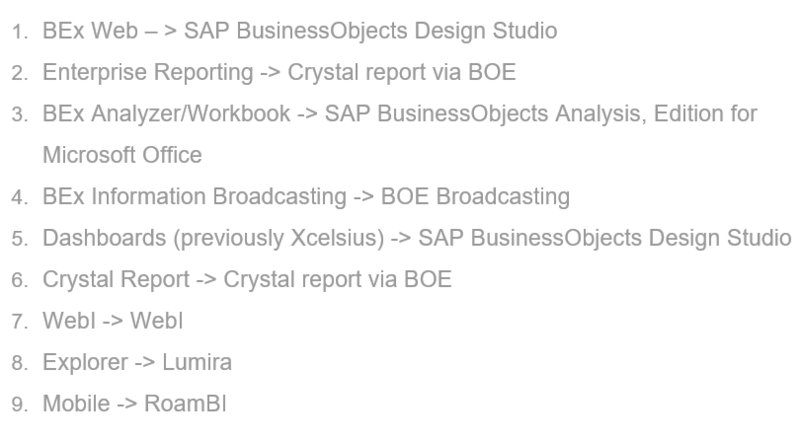 The relevant BEx tools need to be migrated to SAP Business Objects tools such as Design Studio, Crystal & Analysis for Office using the conversion tools provided. Object types from the 3.x data flow are not supported any more and must be migrated. BW4/HANA does not support legacy BW objects like Multiprovider, Infocubes, Infosets　etc. It only supports the new objects like Composite Providers, ADSOs, Open ODS　etc. Modeling in the Data Warehousing Workbench (SAPGUI) is replaced by modeling in the BW Modeling tools in Eclipse. 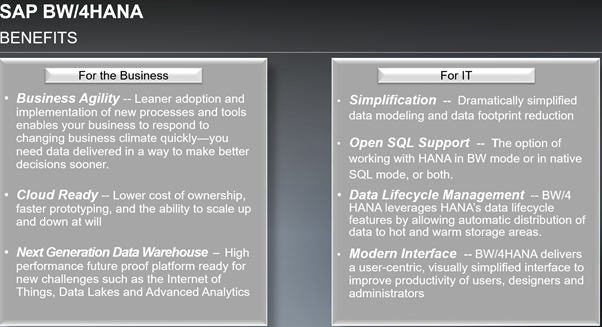 The BW modeling tools have been adapted to the SAP HANA modeling environment. 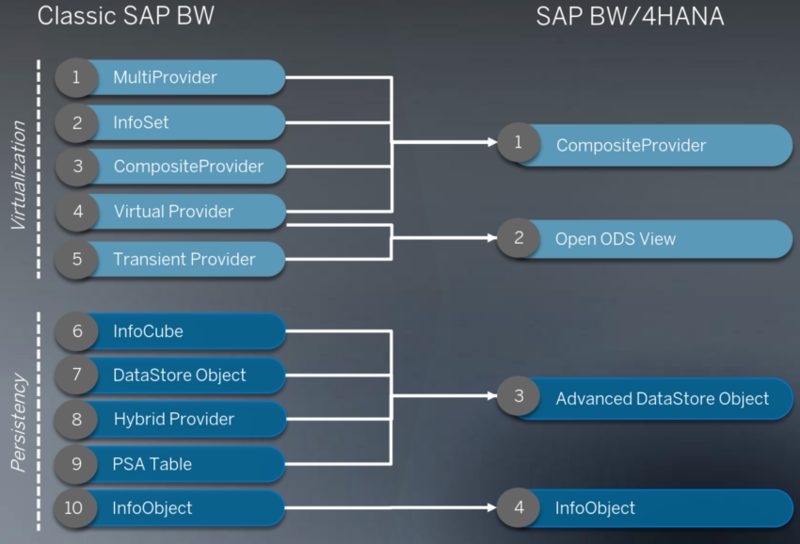 The BW objects recommended for use with SAP HANA are modeled exclusively in the BW modeling tools. All Classical objects need to be migrated to BW/4HANA supported objects using the migration tools provided. Traditional BI Content will not be supported (software components BI_CONT and BI_CONT_XT). New SAP BW/4HANA business content on top of the Business Content DataSources will be delivered in Q4 2016. Data Transfer Processes will now longer support extraction from PSA. Hence, they will always use the Data Extraction setting “Directly from source system. PSA not used” from now on. The respective setting “Data Extraction” has been removed from the Data Transfer Process Maintenance. For the time being however, a small number of objects,　still have to be maintained in the Data Warehousing Workbench before it is completed replaced by Eclipse Platform. Administrative tasks are still performed in the Data Warehousing Workbench. Yes. SAP GUI is still required. DataSource still maintained in DataWarehousing Workbench. All Business Content Datasources (extractors) that are released for Operational Data Provisioning (ODP) will be supported (the ODP Source System is replacing the SAP Source System in SAP BW/4HANA). Nice information. About the second image-can Hadoop be used as a cold storage for BW4HANA? Yes, with BW4HANA there are native connectors for Big data storage like Hadoop. One question – could you clarify which ECC component is the SPS version based upon? 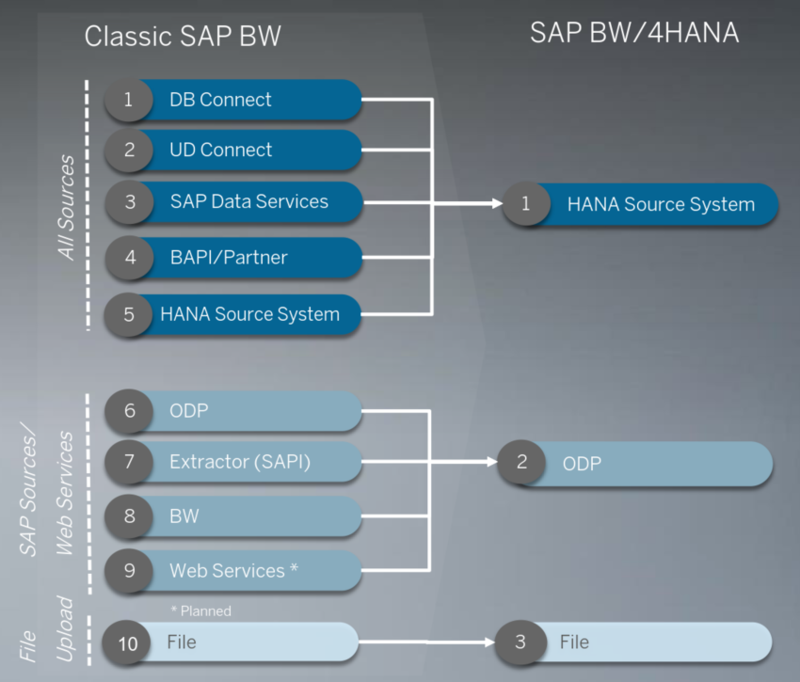 very good article, helpful for anyone migrating to BW HANA platform with knowledge of BW.